Starring: Daniel Brühl, Lluís Homar, Eduardo Fernández, Shi Chi Chui, Vicent Romero, Oriol Villa, Miguel Ángel Silvestre. What are the odds of beating the house during a night at the casino? They’re pretty slim, eh? Anyone who has spent a night piddling away their quarters knows there is a point at which the house will take your winnings if you aren’t smart enough to walk away. The odds vary by game. Slots last for about twenty dollars’ worth of quarters, but yield little returns. Card games vary the most, as they seem to require the most strategy. That dice game is a crapshoot. Roulette, finally, seems impossible to beat because it is essentially a lottery game with a spinner and a little white ball. Winning Streak (Los Pelayos) is the true story about a family of high stakes players who beat the odds and toppled the house at roulette. 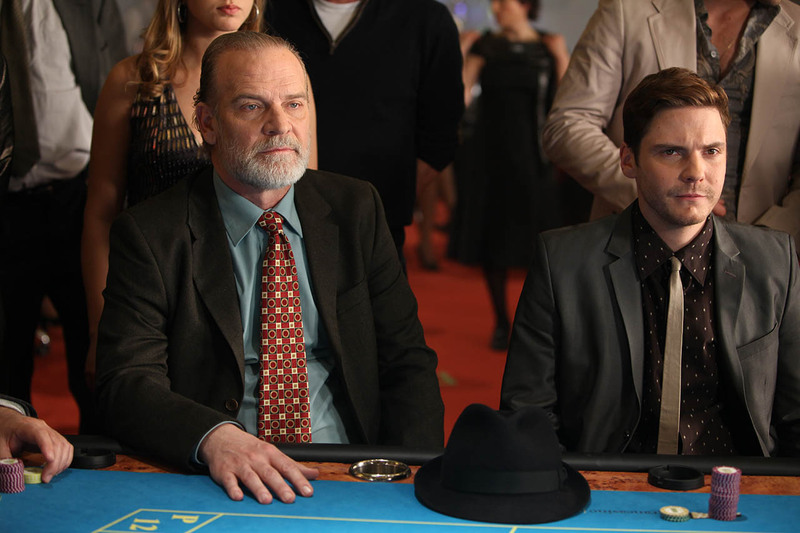 Using a system devised by uncle Gonzalo (Lluís Homar from Broken Embraces), the Pelayo family learns to bet small and watch the numbers that appear the most consistently at the various tables at the casino. 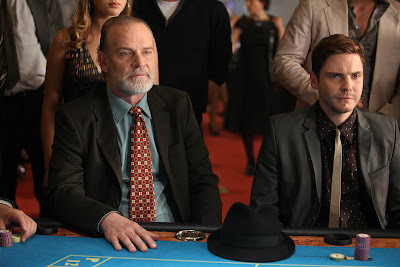 Under the watchful eye of his son, Iván (played by Daniel Brühl, aka Colonel Frederick Zoller in Inglourious Basterds), the Pelayos learn the idiosyncrasies of tables before they gamble and bet big. Gonzalo can’t actually be in on the action himself. A lifelong rounder, Gonzalo has been caught scoping out the casino and has earned the distrust of the casino’s foreman, nicknamed The Beast (Eduardo Fernández, Biutiful). Although there essentially is nothing illegal about Gonzalo’s plan, he avoids the casino because he doesn’t want the wrath of The Beast to interrupt his family’s winning streak. Winning Streak is an entertaining, anti-heist heist film. In the vein of Ocean’s Eleven, or more likely 21, Winning Streak is a stylish affair about friends working to win big and beat the bad guy. The Beast is a cartoonish presence, but not quite on the level of, say, Don Pickles as the Pit Boss in Casino. The film also has a subplot about Iván’s struggle with his own beast, his father. Continually toyed and strung along by Gonzalo’s ambition to topple The Beast, Iván has put much of his own life on the back burner to help his father achieve his goals. This thread, unfortunately, doesn’t really escalate beyond a mere romantic triangle with Iván’s girlfriend/horny Asian stereotype (Shi Chi Chui). Brühl and Homar give admirable performances nevertheless, so fans that first saw them in the films of Tarantino and Almodóvar probably won’t be disappointed. Brühl and Homar’s work is worth noting since they manage to draw out characters that don’t seem to be part of the film’s thin script. Winning Streak never really finds the deeper meaning behind this true story – it’s essentially a film about winning through legitimate means. The gist of the story amounts to “man picks numbers, man buys lottery ticket, man wins.” Winning Streak is a fun little caper all the same, slight as it may be. Winning Streak probably won’t break the bank, but it should at least break even. Winning Streak screened in the Canadian Film Institute’s European Union Film Festival.